Hello! You're looking at our guide to the best fridges. That means either your old fridge just died, or you're moving from a fridge freezer to separate fridge and freezer. Or maybe you just get off on looking at pictures of fridges. That's fine. We don't judge. Anyway, whatever the reason, if you’re looking for the best fridge then you’ve come to the right place. We have reached right to the back of the internet, scraped off the ice, and found the best chillers out there. Not for the first time, we recommend a Miele, specifically the K 28202 D ws. This is quite a costly beast, but its quality is undeniable, as most independent engineers will vouchsafe. You should easily get a decade’s use out of it. That said, this fridge fancier is equally impressed with the cheap-and-cheerful Bosch Serie 2, the TARDIS-like Liebherr TP 1760, and the humongous and befuddlingly monikered Samsung RR39M73407F/EU. Some of the older fridges further down the list offer decent value for money, too. We would like to hope that you don’t need to be told how to buy a fridge. But okay… Make sure you measure up (although most fridges are a standard 60cm in width) and bear in mind that most freestanding fridges can’t be crammed right up against the wall because there’s a whole lot of delicate stuff at the back that needs a few centimetres of space to breathe. Many models come with reversible doors so consider that aspect if you simply must have a door that opens in a specific direction. If you’re going for an integrated (built in) model then prepare to leave it behind if you move, since it’s a right faff to remove and the new buyer won’t be pleased about the gapping hole you’ve left behind. For those in a need of a little tuition in the art of refrigeration, food should, as a rule, be stored as follows: dairy at the top, cooked/ready-to-eat foods in the middle, and raw fish and meat on the bottom shelf. As for the salad compartment… Well, you know what goes in there. All fridges create a mild vacuum on closing the door; it’s a necessary feature that helps keep the cold in. However, this vacuum can make re-opening the fridge – especially immediately after closing the door – a bit of a chore. It’s even more difficult to open if the anti-frost drainage hole at the bottom of the fridge – usually situated dead centre above the vegetable containers – becomes blocked. When this happens, the vacuum increases, sealing the door so tightly the damn thing can’t be opened at all for several seconds. Miele gets round this irritating sticky-fridge-door issue by dint of a levered handle bar that pivots forwards before releasing the door seal, thereby making it effortless to open. This type of system is nothing new but Miele has made a much better fist of it than others. The Dynamic Cooling function is another great feature. Air humidity helps keep foodstuffs fresh but too much humidity in one area is a bad thing, especially with wilty items such as lettuces. This model comes with a fan that distributes the humidity – and cold air – evenly round all areas, keeping everything in tip-top shape for longer. Space-wise you get five height-adjustable shelves, a wine rack, two vegetable containers (with extra fixed shelf above) and another five narrow door shelves for milk, beverages, condiments, eggs, butter and cheese. As with most tall larder fridges, this one measures 1.85 metres from tip to toe so reaching the back of the top shelf can be a literal stretch. If you have the readies and 60cm of space with no cupboards above, make this stylish high-end cooler your first port of call. If you’re looking for a mid-sized larder fridge that doesn’t cost the earth, provides plenty of space, cools quickly and is cheap and reliable to run, consider this extremely efficient model from the Bosch assembly line. The trouble with most fridge shelves is that, once full, it’s a right pain trying to locate stuff like the Marmite that has somehow worked its way to the back of the fridge along with the mouldy saucisson you completely forgot about. This model rectifies that snag by having shelves that can slide out to a small degree, allowing easier access to stuff at the rear. It’s a great hassle-saving feature that poses the question: how long before a manufacturer comes up with a solid telescopic system that allows every shelf to be pulled out to its full extent? The Serie 2 has a net capacity of 290 litres which isn’t too shabby. The interior layout’s impressive – those four adjustable, slide-out shelves, a single veggie box and four narrow door containers for the usual suspects. Which? has given this ‘incredible’ model a whopping 92% (its second highest score) and who are we to argue the toss? If you’re looking for a fridge that does it differently then the Bosch KSV36VB3PG will be right up your street. If you’re into movies then you might think it looks like the 2001 Monolith. Yup, this 187 cm high fridge is an imposing beast that oozes lots of mean and moody class. Open it up though and you’re greeted with a fridge that ticks all of the boxes. The capacity is certainly there, with 272 litres of the stuff that covers everything from a selection of storage shelves in varying shapes and sizes through to the door shelves. These beauties can handle everything from giant-size milk containers down to petite tins of fizzy drink, so add it all together and you have a fridge that’s perfect for families. In fact, the Bosch KSV36VB3PG makes a lot of sense if you prefer to do a once-weekly shop as it can handle a mountain of grocery shopping in one go. We love the way the storage space is evenly spread throughout, with no real lean areas. Four of the seven shelves can be adjusted for height too, which means you’ll be able to get, well, anything sizeable in without fuss. It’s also a Bosch, so the energy rating is a very agreeable A++, which should help you offset the higher initial outlay over time. Plus, the design offers reassurance as it features a flame-retardant backing. The appliance is particularly adept at keeping temperatures consistent in a variety of temperatures too, and it’s also able to keep things cool while you’re piling in all that shopping, thanks to an automatic fan. The Bosch KSV36VB3PG seems very capable at keeping temperatures cool across the board, so stuff at the top will fare just as well as items in the lower areas of the appliance. That’s impressive, as is the way this fridge goes about its business making very little in the way of noise. While that exterior finish might not be to everyone’s tastes, the Bosch KSV36VB3PG is still an excellent fridge. And, in the right surroundings, this appliance will be an instant talking point the next time you have friends round. With its integrated styling the hugely impressive Siemens KI22LVS30G is a great option if you’re looking to have a built-in fridge that can fit either under a worktop or in an eye-level compartment. Dimensions of 88 x 55 x 51cm mean it’ll work a treat if you have fitted units, or are thinking of going down that route in future. Oh, and there’s a reversible door if you’re wondering if it’ll be versatile enough for your own fitted kitchen. Considering its cut-down specification the Siemens KI22LVS30G is still able to offer up 73 litres of storage space across three shelves along with a trio of full-width door racks. Plus there’s a full-width crisper drawer for good measure. If you’ve got an average-sized grocery shop then it should be fine and dandy. However, there’s a bonus in the shape of an icebox, which is accommodating enough for the likes of oven chips or, perhaps, a tub of gelato. We also like the easy clean surfaces inside the Siemens KI22LVS30G, which means it’s very straightforward to get rid of crumbs and food residues without too much upheaval. Siemens has done a nice job with the engineering here too as the unit can super cool food once you’ve got it home from the supermarket. In fact, the compact fridge can chill things surprisingly quickly, which is good news if you’ve got fragile purchases that wilt in no time. Better still, Siemens ingenuity means that the KI22LVS30G is able to keep temperatures consistent no matter where it’s located or the external conditions. The Siemens KI22LVS30G performs acceptably well on the energy efficiency front and, for added safety, there’s a flame-retardant backing to the fridge. The appliance won’t get on your nerves either thanks to reasonably muted operation. Liebherr is a family-run, German-originated company based in Switzerland that specialises in the production of some of the world’s most humongous industrial mining machinery and earth-moving equipment. It also supplies aircraft parts to Airbus. With that kind of pedigree, how could it possibly make a duff fridge? This model is arguably the only A+++ rated under-counter model on the UK market and that means it’ll be dirt cheap to run. But that’s not the main reason you’ll like it because, despite its diminutive exterior, inside it’s like the Albert Hall. This chilled Tardis is equipped with two separate salad/veg drawers with integral shelf and three more adjustable shatter-proof glass shelves above. Rather ingeniously, the top shelf is narrower than the others, allowing tall items to be placed on the shelf below. This isn’t the cheapest under-counter model on the market, but you get what you pay for: it’s extremely well built and, judging by the raft of positive reviews, likely to be very reliable. Crucially, its internal temperature remains consistent in all ambient conditions, including extreme heat. Well worth a gander. This imposing silver behemoth has the capacity for a stupendous 375 litres of food and drink – enough for a family of five. It comes equipped with two large vegetable containers replete with humidity control, a wine rack, a non-plumbed water dispenser, four main glass shelves and a ‘Slide-in’ shelf that splits in half to accommodate taller items below. Like most higher-end models, the Samsung incorporates a fan to vent cold air to every shelf and a fast-cool function that rapidly drops the internal temperature after adding new shopping loads. Its digital inverter compressor, meanwhile, ensures accurate cooling in all ambient temperatures, and without making a noise in process. This A+ rated, 43-litre Russell Hobbs counter-top larder fridge is perfect for studio flats, bedsits, student digs and mobile homes. It’s also useful as a backup fridge. For its size, this dinky chiller provides surprisingly ample estate for most solo needs. The main compartment will happily accommodate two or three pre-packed meals, a small amount of fruit or veg and a tub of butter. It also has a titchy freezer compartment with space for a dozen tightly-packed Magnums or a packet of frozen peas. The inner door, meanwhile, has room for a two-pint carton of milk or litre of water, a couple of Sols and a pot of marmalade. Not bad for a fridge that measures just 49cm tall by 47cm wide. Its A+ energy rating will make it cheap to run, too. The vast majority of large household appliances are around 60cm in width – a standard measurement adopted by every manufacturer, whether it’s a fridge, dishwasher or washing machine. Mindful that not everyone has acres of kitchen space to spare, we set off on a forage for a slim line fridge and found one in this smart and very reasonably priced Beko. It measures just 47.5cm across so there’s every chance you’ll be able to squeeze it in among your existing appliances. 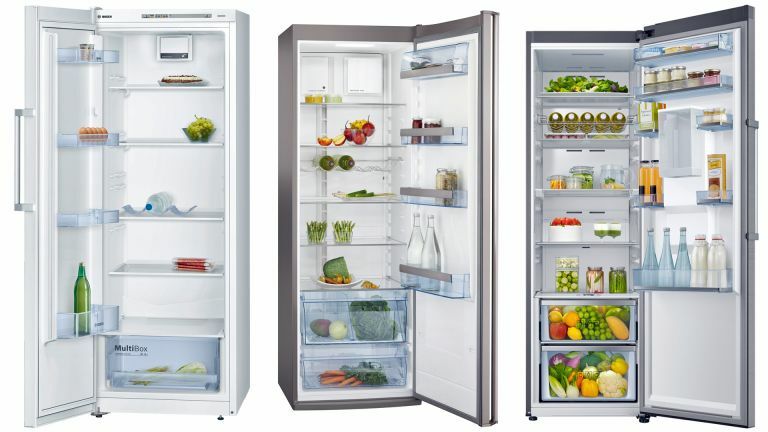 The Beko comes with two fully adjustable glass shelves plus an extra fixed one above the ample vegetable compartment. Attached to the door panel are three non-adjustable drink and condiment shelves. With 88 litres of space available, this fridge is just the right size for singles and couples or those with budgetary as well as space constraints. Neff specialises in built-in appliances that hide behind the kitchen cabinetry. This one has a capacity of 144 litres and an energy efficiency rating of A++. As compact fridges go it’s quite basic and comes with four shelves (three adjustable) and three door trays, along with a decent-sized vegetable and fruit compartment. It also features a SuperCool function with automatic deactivation and sensor-controlled temperature. The interior of this Neff model looks remarkably similar to that of the Bosch reviewed elsewhere in this roundup though the quality and finish of the Neff’s interior shelving is a wee bit better. This tall 1.86m freestanding larder fridge is energy rated A++ and has the capacity for up to 346 litres of goodies – more than enough for a family of four. It comes with five height adjustable glass shelves, a wine rack and another five condiment, milk and bottle trays attached to the inside of the reversible door. Rather cleverly, the middle door tray can be adjusted for height while fully loaded. As we all know, fruit and vegetables have a very short lifespan so any fridge able to extend that can be considered a bonus. This model comes with just such a device and most simple it is too. Siemens calls it a hyperFresh box but basically it’s just a (brittle) plastic container with a sliding valve that lets excess moisture escape, keeping leafy vegetables, tomatoes and the like fresh for up to twice as long. It works very well. A second box situated below is great for harder veg and fruit like potatoes and apples. The iQ500 is a doddle to programme because it only has a single plus/minus temperature control and a Supercool button for chilling new fridge loads.